Q. How much headroom should I leave with 24-bit recording? I used to record in a very 'old school' way; as 'hot' as possible without clipping, and always watching the meters like a hawk. But what average levels should I use if I'm working with 24‑bit digital audio? SOS Technical Editor Hugh Robjohns replies: The basic idea is to treat ‑18dBFS as the equivalent of the 0VU mark on an analogue system's meter, and that's where the average signal level should hover most of the time. Peaks can be way over that, of course, typically kicking up to around ‑10dBFS or so. Drums, being largely transient peaks, will be kicking up there regularly. If the material you are recording is well controlled and predictable in terms of its peak levels — like hardware synths tend to be, for example — you could legitimately reduce the headroom safety margin if you really want to. But in practice there is little point. The only advantage to recording with less headroom is to maximise the recording system's signal‑noise ratio, but there's no point if the source's signal‑noise ratio is significantly worse than the recording system's, and it will tend to be that way with most analogue synth signals, or any acoustic instrument recorded with a mic in a normal acoustic space. The analogue electronic noise floor or the acoustic ambience will completely swamp the digital recording system's noise floor anyway. Recording 'hot', therefore, won't improve the actual noise performance at all, and will just make it harder to mix against other tracks recorded with a more reasonable amount of headroom. One issue that comes up a lot is the confusion between commercially released media (CD, MP3, for example), which have no headroom margin at all (they peak to 0dBFS), and the requirement for a headroom margin when tracking and mixing. 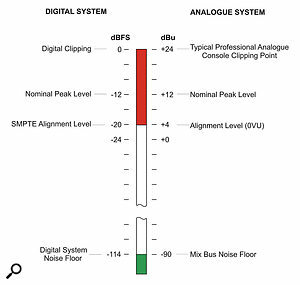 This diagram shows a comparison of traditional professional analogue console signal levels and SMPTE recommended digital equivalents. Going back to traditional professional analogue audio systems, the practice evolved of recording signal levels that averaged around 0VU. OK, you could push things a few decibels hotter sometimes for effect with analogue tape, but a level of around 0VU was the norm, and that normally equated to a signal level of about +4dBu (VU meters are averaging meters and don't show transient peaks at anything like their true level). Analogue equipment is designed to clip at about +24dBu, so, in other words, the system was engineered to provide around 20dB of headroom above 0VU. It's just that the metering systems we use with analogue don't show that headroom margin, so we forget it's there. Digital meters do show it, but so many people don't understand what headroom is for, and so feel the need to peak everything to the top of the meter anyway. This makes it really hard to record live performances, makes mixing needlessly challenging and stresses the analogue monitoring chain that was never designed to cope with +20dBu signal levels all the time. By recording in a digital system with a signal level averaging around ‑18 or ‑20 dBFS, you are simply replicating the same headroom margin as was always standard in analogue systems, and that headroom margin was arrived at through 100 years of development for very good practical reasons. 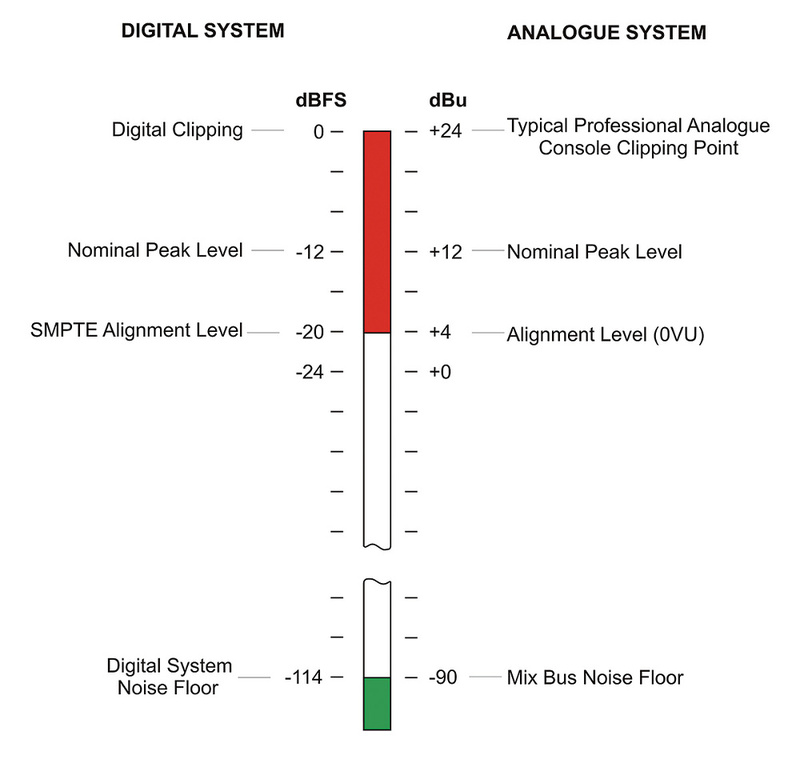 Furthermore, the noise floor of a typical analogue console might be around ‑90dBu (‑100dBu was always the holy grail). That gives a total dynamic range of 90 + 24 = 114dB, which happens to be the same as a typical budget 24‑bit digital interface. The very best interfaces and converters are currently providing dynamic ranges of around 124dB, which is the same as the holy grail of analogue gear. So working with average levels of around ‑20dBFS or so is fine and proper, works in exactly the same way as analogue, and will generally make your life easier when it comes to mixing and processing. The old practice of having to get the end result up to 0dBFS is a mastering issue, not a recording and mixing one. It is perfectly reasonable (after the mix is finished) to remove the (now redundant) headroom margin if that is what the release format demands. A sensible headroom margin is essential when tracking, to avoid the risk of clipping and allow you to concentrate on capturing a great performance without panicking about the risk of 'overs'. A similar margin is also required when mixing, to avoid overloading the mix bus and plug‑ins (yes, I know floating-point maths is supposed to make that irrelevant, but there are compromises involved that can be easily avoided by maintaining some headroom!). Once the mix is finished, the now redundant headroom can be removed, and that is a standard part of the mastering process for digital media like CD and MP3.